Ecore presents new products from Ecore Athletic's new Elevate Collection, a group of surfaces that raises the bar when it comes to conventional fitness flooring. Spectator is a 2.5mm luxury vinyl tile offered in high-end wood and texture visuals and is available in planks and tiles. Frictional is a 2mm vinyl safety floor with an enhanced coefficient of friction to prevent falls, while Aqueous is a 2mm vinyl safety floor designed for continually wet areas where people are barefoot. Taraflex Sport M Comfort offers the most protection upon impact from jumping, diving and falling, compared to other sports floors, making it the ideal flooring for fitness facilities. Taraflex Sport M Comfort is the only sports floor with three layers of triple-density foam backing, which will allow your guests and staff to train harder and longer as it provides the highest comfort and shock absorption to prevent immediate and long-term injuries upon impact. Harper Turf Equipment unveiled details of the next generation of self-propelled turf vacuums—the TV35. This redesigned vacuum promotes time-saving and economical features such as a new cooling system, ergonomic operator station and smooth foot-pedal operation. The most noticeable change is the remote-mounted radiator and oil cooler for improved temperature control. The hydraulic powered cooling fan can be reversed to blow debris off the screen. When it's time to service the machine, the screen easily removes for deep cleaning. GymValet® is the only holder specifically designed to attach sanitizing spray bottles and towels directly to cardio and strength training machines, as well as functional, cross-fit and HIIT equipment. With the super-sturdy GymValet, equipment cleaning supplies are always conveniently accessible to members and staff to better ensure that equipment surfaces will be cleaned and sanitized immediately before and/or after use. GymValet installation is easy with GymValet's unique Velcro strap attachment system—no tools required. Spectrum Aquatics launches the new ADA Portable Motion Trek BP 300 Lift. Built for durability this pool lift is easy to use, saving deck space. 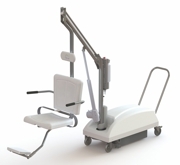 Since the lift is mounted on wheels, it can be wheeled out of the way and stored when not in use. It is freestanding and features a lock down kit to fasten to the deck. The Portable Motion Trek BP 300 offers a slightly slower rotation, giving the user more controlled and comfortable movement from the desk to the water. The toughest land-clearing and ground-leveling jobs are no match for the new John Deere Root Rakes, the latest additions to the ever-expanding lineup of Worksite Pro™ attachments. Optimized to work with John Deere G- and E-Series skid steers and compact track loaders, and K-Series compact wheel loaders, these attachments get the job done quickly and can be a more economical option over dozer blades. The root rakes are ideal for land clearing, ground leveling and moving materials away from buildings and obstructions. Upace is the first customizable, two-sided mobile platform that offers real-time data and student interactions that boost usage, retention and operational efficiency. Recreation and fitness center managers can remotely and instantly access analytics, communicate directly with students and update the app within minutes. Via the app, students can view center occupancy, reserve equipment, sign up for classes and more. Upace is "Fitness Meets Convenience" for administrators and students alike.